I like to bang on about service in restaurants, but this week it occurred to me that I might be part of the problem. After all, I talk about service, but if you look back at my other reviews it’s usually tucked away near the end. It’s the penultimate paragraph, stuck between the desserts and the summing up, sharing space like uneasy housemates with the bit about How Much It All Cost. For some reason it’s difficult to write about service in detail unless it’s bad, and when it’s bad I feel guiltier about going into detail than I would about a disappointing dish. Funny how the human face of a restaurant, even though it’s what you see, attracts less comment than all the faceless people toiling away in the kitchen. So, to redress the balance, even if only for one week: the service at Alto Lounge was some of the best I’ve had in a long time. The two women working the night I went were an absolute joy: friendly, likeable, helpful and interested. They stopped me going up to the bar to order more drinks when my food had just arrived, even though technically Alto Lounge doesn’t do table service. It properly felt like they wanted to make sure I had a good evening, and when I settled up and left the goodbyes were so genuine that it made me want to go back. I was especially impressed with the service because I wasn’t expecting it to be quite that good. Alto Lounge is a casual dining place: not quite a restaurant, not quite a café, not quite a pub. It sits on the main street in Caversham, along from Waitrose and opposite Costa Coffee (in fact, looking at their other Reading location, in Woodley, you might think their policy for new branches is just find somewhere near a Waitrose). I’ve had people recommending Alto Lounge’s breakfast to me, but it’s always felt like a bit of a trek out of town for the first meal of the day. However, the rest of the menu felt like it warranted further investigation. For a start, there was a tapas section (Reading really is missing out on tapas) and also, with my New Year’s resolution in mind, I was pleasantly surprised by the number of vegetarian options. Yes, it’s that week of the month. I liked the interior of Alto Lounge. It’s dark without being gloomy, the walls covered in cool posters and Tretchikoff prints, retro without feeling naff or calculated. The furniture was reminiscent of Bill’s (I wonder if they get their school-style chairs from the same supplier?) but the atmosphere was buzzier and more intimate. So, great service, great atmosphere and a lovely room. I suppose the Hollywood ending here would be for me to rave about the food, you could all add it to your list of reliable, affordable places to visit in town and we could all go on with our days that little bit happier. I’d love to be able to do that, but reality is never anything like Hollywood and so it proved here. We started with tapas – Tuesday is “Tapas Tuesday” at Alto Lounge and you can get three dishes with a glass of house wine for under a tenner – which might have gone some way to explaining the crowds (they also have “Cheeky Monday”, but I don’t ever want to be the sort of person who has a “cheeky glass of wine”, so I didn’t pay it too much notice). The tapas at Alto Lounge is a good example of how authenticity isn’t everything. So for instance, the pick of the bunch was shredded pork in sticky sweet five spice with a sprinkling of coriander – about as Spanish as I am, but very tasty all the same. The beetroot and feta tortilla wasn’t bad either – more a frittata than a tortilla, with not much egg and lots and lots of chunks of waxy potato which dominated it somewhat. I liked the feta in it, which added the salt it needed to save it from blandness. I quite enjoyed it, even if it was about as Spanish as someone who went to Barcelona once on a city break. Last but not least, the lamb koftas with grated carrot and tzatziki were gorgeous – the lamb coarse and well-seasoned, the texture just right and the tzatziki respectable and fresh. Gorgeous and, well, Greek. 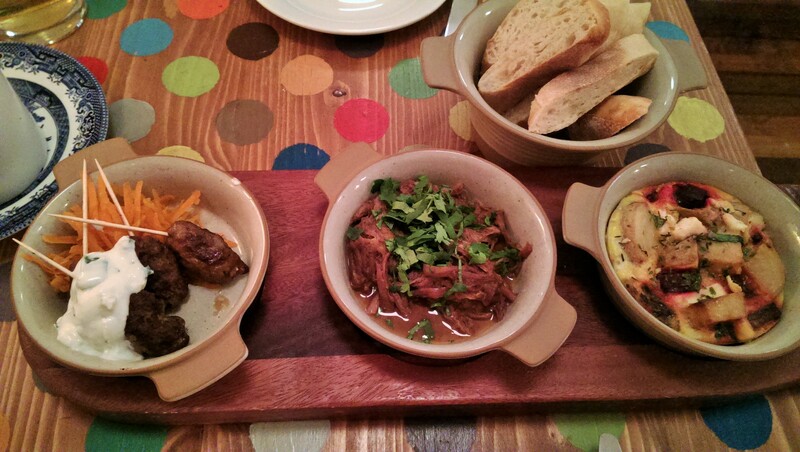 On a normal night these three dishes would cost a little over nine pounds – great nibbles if you were here for a drink but, perversely, not brilliant value as a starter. No, where things really went wrong was with the mains. The falafel burger sounded perfect on paper – sweet potato falafel, halloumi, roasted peppers and tomato chutney, the kind of dish that, well-executed, could stop a diner missing meat for good. In reality it was out of balance in every way. The falafel burger was a big hockey puck of a thing (“it looks a bit Findus” was the dubious feedback from the other side of the table) and, possibly because of the sweet potato, tasted oddly soapy. The texture was smooth not coarse and, because it was so huge, it was too much fluffy middle and not enough crunchy edge. The slice of halloumi, by contrast, was the thinnest I think I’ve ever seen (let’s face it, nobody has ever looked at a dish and said “you know what, that is way too much halloumi”). There was a little smear of chutney and some peppers – and a lot of raw red onion which I could have done without – but overall it was hard, hard work. The coleslaw with it was in an oddly thin and watery dressing, the fries (allegedly skin-on) felt like oven chips. 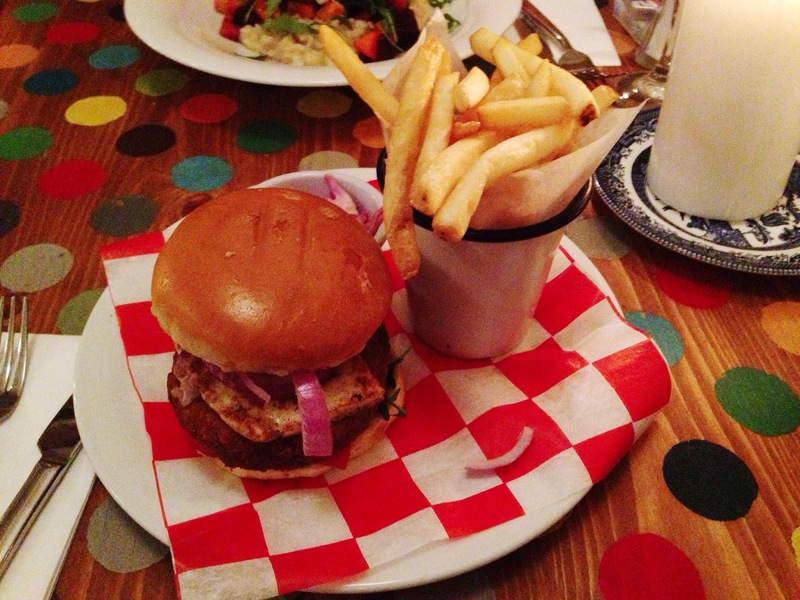 But the burger was the Achilles heel – I could have forgiven everything else if the falafel had been up to scratch. The winter vegetable risotto was similarly disappointing. On the bottom was a layer of plain, unflavoured, unseasoned risotto which had been cooked for so long that it lost any bite and was claggy, like wallpaper paste. No shallots or garlic in there, either. Next up was a layer of winter vegetables which, dare I say it, I suspect had been roasted, then chilled, then microwaved. Some were hot and chewy, some were cold and chewy and most of them were – again – flavourless. On top of that was a handful of rocket with a few slivers of hard cheese, which I think was Parmesan, sprinkled with a few seeds. I ordered this dish thinking it was vegetarian – although it’s hard to tell – the menu doesn’t actually list the vegetarian options (it says there’s a vegan menu, no mention of a vegetarian one). Nor does it mention that this dish contains Parmesan, for that matter. Perhaps I am being too tough and were I a real vegetarian I would know to ask, but it still felt – to me at least – neglectful. Even with the cheese it all tasted largely of nothing and, worst of all, I can (and do) cook a considerably better risotto at home. The best bit of the whole dish were the five crispy leaves of fried sage; a little touch that suggests all is not entirely lost in the kitchen. I liked Alto Lounge so much, and I so wanted them to recover from the mains, that I wanted to order dessert. But when push came to shove, I couldn’t do it. The selection is limited to five options you see pretty much everywhere (brownie, treacle tart, apple pie, cheesecake, sticky toffee pudding) and it felt more meh than menu. So we paid up – dinner for two with three tapas, two mains, a couple of glasses of wine and a few ciders came to thirty-five pounds – and said our goodbyes. Normally first impressions are everything, but actually with Alto Lounge it’s the last impression that has stayed with me. It was sparsely occupied when I turned up, but by the time I left only one table was free, and looking back through the windows from outside it had the warm, welcoming glow of a place you want to visit. Almost a trick of the light, but not quite. How I wish I’d liked the food more. No, that isn’t right: how I wish the food had been better. I actually can see myself coming back, but more in its capacity as a bar. I could quite happily grab a table with some friends, open a bottle of wine or get the ciders in, play cards or a board game and keep ordering tapas until I was full. Maybe that’s what they are aiming for, but as a restaurant it doesn’t quite cut it. I’m sad that I can’t wholeheartedly recommend it – but maybe you should go, even if only once, just to see how much great service makes you want to overlook. Living in Caversham, Alto Lounge is somewhere I visit often, perhaps more often than the other options, but to put that in perspective, I’m almost as likely to end up in Wetherspoons. I’d agree with most of your review, I think, the food can be a bit hit and miss, it’s never spectacular and they often have items on the menu missing because they have sold out, which is testament to how busy they are, but it’s not too expensive and has a decent enough range of options. Breakfast is probably where it is strongest, if you can manage to grab a table on the weekend and it isn’t full of toddlers screaming. There are better places to go for dinner, but none of them are really the type of place that you can walk into without booking. I really think Caversham is screaming out for more casual dining options, and there’s certainly space in the market. I prefer to take a walk in the other direction to The Grosvenor, personally, but that limits your options for carrying on the evening. That’s encouraging feedback, and I have had people consistently praise the breakfasts. But I don’t generally review them, so I decided to go there for dinner. I agree that casual dining is an area where Reading maybe isn’t as well served as it should be, and one where sometimes it feels like the chains have things sewn up. I also live in Caversham and head to Alto quite often, especially for a breakfast/brunch when hungover! I think this review captures the atmosphere well, but is slightly unfair on the food. I know places should do vegetarian food as well as other food but…there aren’t as many vegetarians?! Would like to see a review of now veggie mains. 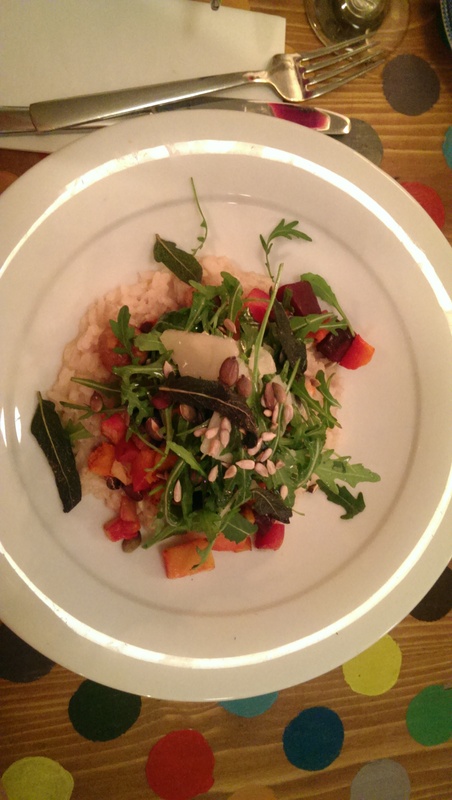 Roberto – my resolution is to pick one vegetarian main every month, but I happened to pick two when I went to Alto because I fancied them both! I don’t really get the argument – if you’re saying that maybe they just have them on their menu as a box ticking exercise then I could understand them being poor (although it doesn’t excuse it) but Alto has a lot of vegetarian options on the menu. Either way, I think they should do them every bit as well as the meat options regardless of how many vegetarians there are. They play the numbers game though, as other places do. But as you say, the service and atmosphere almost – almost – make up for those who don’t enjoy the food. Which begs the question: what’s the most important thing to cater for in a bar/restaurant and be successful? I’ve given the vegetarian food several chances over the last few years and have been so disappointed I’ve refused to eat there for the last year to the annoyance of my non veggie partner and friends. frozen in the middle orange hash browns with the breakfast and soup that was I think just hot water with salt and pepper particularly stick in my mind / throat. I do want to like it and will try it again with something very basic as I do find myself in caversham with kids quite often and it is a nice easy place to go to. It does seem an insult when veggie mains seem not to be regularly tried by chefs or staff, not sure how you explain the below mediocrity otherwise. Have to say I’ve learnt to stay away from veggie burgers other than Bill’s Hallumi burger and any at Mildred’s veggie restaurant in Soho. I’m sure there are lots of exceptions but as a veggie I tend to play it quite safe when ordering in most places as the hit vs disappointment rate seems to much worse than for meat dishes, that’s why reading reviews that include some non meat dishes are so helpful. I’m really pleased to see this comment. My resolution to try at least one vegetarian main a month was prompted by feeling like some of my readers (and friends) miss out having to read about meat dishes all the time. I do really think that vegetarian mains should be an opportunity for chefs to be imaginative and show what they can do without meat, and there really isn’t any excuse for them being worse than the rest of your menu. Do you recommend any Reading restaurants for vegetarian food? Roberto, I don’t agree. When you have that many vegetarian options on your menu I think you are setting yourself up as being able to cater well to vegetarian diners. And to answer your question – for restaurants at least – I think food is the most important thing. Closely followed by service, but food first and foremost. Personally I would say service and atmosphere are more important than food. I mean no-one is going to go back and eat something that was disgusting. But if I go somewhere and the food is not great, but the place seems good I may assume I made the wrong food choice and return. If it is dead and atmosphereless I probably will not return. The Lounges seems to have set themselves up as a sort of slightly upmarket Wetherspoons. So I agree with Gareth, they are a place you are likely to end up in rather than deliberately head out too. That’s fair enough, we’re all different. But service would have to be pretty amazing for me to go back and eat unremarkable food somewhere. Yes, I suppose this is right. Excellent food in a sterile room is no fun at all. I think maybe the relationship is too complex to sum up as “X is the most important”, so I stand corrected!